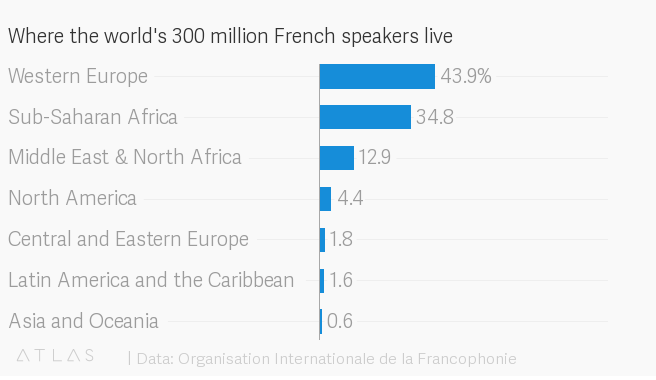 300 million people across 5 continents speak French. Africans are making French a truly global language. 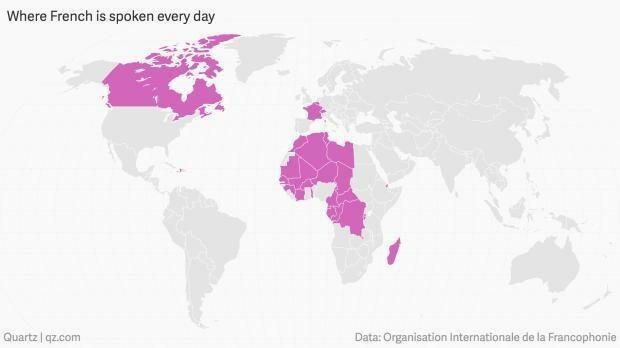 French has moved up a place to become the world’s fifth most spoken language, thanks largely to the millions of Africans who speak it each day. There are now 300 million people on five continents who speak French, according to a recent by the Organisation Internationale de la Francophonie (pdf in French). French is ranked behind Chinese, English, Spanish and Arabic. “The center of gravity of the Francophonie continues to move south,” the report found. The number of people speaking French has shown a steady increase: up nearly 9.6% since 2014. Measuring from 2010 to today, 22.7 million more people speak French: 68% of these are sub-Saharan Africa, while 22% live in North Africa. The Americas are home to 7% of the world’s French speakers, while Europe is home to only 3%. Much of this is due to Africa’s age demographic, specifically the continent’s youth bulge. The daily use of French has increased by 17% on the African continent from the survey period 2010 to 2014, compared to an 11% growth in the rest of the world. In Asia and the Caribbean the daily use of French is decreasing, and this is largely due to education systems that no longer embrace the language as they did before, opting instead for Chinese or English. A previous generation of African leaders have been criticized for their failure to introduce the official use of African languages, and yet it seems Africans today are ensuring that European languages remain relevant. Of the Africans who were surveyed by the francophone organization, between 80% and 100% expressed the desire to would want to pass the language on to their children. French remains the sole official language in 11 African countries, and the second official language in 10. It is also the main or only language of instruction in schools in Benin, Burkina Faso, the Central African Republic, the Comoros, Congo-Brazzaville, the Democratic Republic of Congo, Côte d’Ivoire, Gabon, Guinea, Mali, Niger, Senegal and Togo. In most of these countries, though, French is one of many languages spoken, which influence how the language is spoken. Nouchi in Côte d’Ivoire and Toli Bangando in Gabon were born out of urban francophone Africa, by young people who made the language their own by combining it with their vernacular languages. It’s worth noting French, like English and Portuguese in other African countries, serves as a lingua franca in part because of the multitude of languages spoken in many African countries.